A part of the driver jigsaw for 2008 has fallen into place at last. This morning, it was announced that Fernando Alonso will be leaving McLaren; no news yet of where he will be going or who will replace him, however. The statements are pure corporate-speak, Alonso sounding as if butter wouldn't melt in his mouth and it is impossible to ignore the thought that this was part of the agreement - that he say something to offset his damaging accusations during the season. Ron Dennis was also gracious in his consideration of the Spaniard, professing to be unsure of what went wrong in the team's relationship with him. One can sense the relief in all this, however. It was an unfortunate arrangement that should have worked but foundered quite early on, wrecked on the rocks of a team mate too quick for comfort and a press too eager for scandal. A parting of the ways is really the only sensible solution. So, whither Alonso? At the moment, the most likely destination seems to be Red Bull, a late entrant to the field of speculative guesses. Theirs is the latest rumor, superbly timed just before the announcement of Alonso's departure and still fresh in our minds as a result. They have the money to pay off McLaren and a driver pairing that could do with a little spicing up - no offense to Coulthard and Webber but they do tend to have the same strengths and Red Bull need someone who can do the unexpected occasionally. And, if it is to be Red Bull, which of their two drivers would have to go? I hate to say it but Coulthard is the obvious candidate, a full career behind him, an autobiography just published, and several years of suggestions of retirement already in the bag. Webber may be unexceptional in the race but he certainly knows how to qualify, at least. The other strong candidate to take Alonso is Renault, of course. Flavio Briatore has been almost manic in his insistence that Fernando can return anytime and Kovalainen is held up as bait for McLaren, but I keep hearing the words of Renault chief, Carlos Ghosn, when he threw cold water on the idea of the company actually paying money for the services of a driver, no matter how big a name. Although I have felt all along that Renault and Alonso would be the best fit, it seems that financial considerations will rule that one out. The same applies to the rather fanciful idea of Alonso going to Williams. That is fueled more by the romantic idea of Rosberg in a McLaren up against Hamilton than any realistic chance of Williams finding the money to employ Alonso, even if the team wanted him. I think Sir Frank and Patrick Head have enough sense to know that they already have a top class driver and therefore do not need the hassles that Alonso would bring them. And anyway, Nico's father, Keke, says no. Toyota may have been a possibility at one stage but I doubt that Fernando would consider the idea seriously. Reports that the Japanese giant is working through contractual difficulties with Timo Glock would seem to indicate that Toyota have given up on the idea of Alonso too. And Ferrari are almost certainly out of the picture. Which all points towards Red Bull. It would fit with the rumor that Ron Dennis has said Alonso cannot go to one of the manufacturer teams. As for a driver to replace Alonso at McLaren, it has to be said that de la Rosa is in pole position for that one. His appointment would mollify McLaren's Spanish sponsors and would guarantee the team a breather from the problems inherent in a double number one policy - unless my commenter, Number 38, is right and Pedro turns out to be as fast as Hamilton! Round about now is when I renew my calls for the consideration of Gary Paffett but I know I'm on a loser with that one; the poor guy never even gets a mention. And, if Ron thinks as highly of him as I do, that might actually count against him - I don't think the team can face another year of driver squabbles. Of the remaining possibilities being mentioned, Jenson Button isn't going to happen because of the restriction of sponsorship to the UK, and the other suggestions are highly unlikely because they depend on driver swaps, which are as rare as hen's teeth in F1. Next year will be Lewis Hamilton against the rest, presuming that the McLaren car is competitive. And he won't be easy to beat. As has been mentioned often, he can only get better and, like him or loathe him, he is phenomenally talented and quick. I'm fearing for DC as well! I couldn't understand why they signed Webber to partner him last year when they are so similar as you say - DC paired with a young gun seemed the perfect way to progress things so you'd have to assume Webber was here to stay and DC will have to make way for a new driver. Unless Flav has a hand in things and Alonso signing for Red Bull would then allow Webber to make the switch to Renault, leaving DC to pair up with Alonso. It's going to be really interesting, and I hope DC's career isn't finished this way. I agree, Craig, it would be a sad way for Coulthard to end his career. But I must admit I don't see the Wbber to Renault thing happening. Flavio will sulk if he doesn't get Alonso. I hate to say it, but I think that Lewis will win it all next year. If anyone has a chip on his shoulder its The Ham. As for DC, I will miss him, but anyone who has been in the sport for that long and has made that much has nothing to be upset about. There are other forms of motorsport that would love to have him. Actually, I think DC would really enjoy other forms of motor sport after the pressures of F1. He's done a good job over the years and will be missed but it would be great if he tried the BTCC or Le Mans for a change. I think they'd suit him. Webber is perceived to be mega quick in qualifying. Alonso loses the plot every time his team mate is faster. So why would his management put him in that situation and why would Dietrich Mateschitz pay him all that money and then put him in a situation that is certain to aggravate him? For me as soon as I heard the Red Bull rumour I assumed Webber was out. I cannot see them getting rid of DC when you consider everything he has done for them and when he has demonstrated that he can cope being in a team with one of the top drivers. I cannot see any reason to keep Webber and get rid of DC. You may well be right, Steven - I was looking at it purely from the point of view of age, really. Webber has many good years left in him whereas DC, well, he gets asked every year whether he will be retiring soon. Heidfeld - BMW would really benefit from a driver of Alonso's ability. Mclaren would really benefit from a hard working, competent, experienced number 2. Could it happen? Webber - Don't know why. Somehow, I just can't see it. Think he might do a damned good job if he got it though. Agreed that Rosberg is unlikely as a replacement McLaren driver - there are just too many reasons against the move. I don't see BMW being interested in Alonso, however. They seem quite happy with their present line up and Theissen is too level headed to put up with the kind of problems Alonso might bring with him. Button? That's an outside bet at the best of times. It might give Ron a good laugh, at least. And then there's Webber, always the fly in the ointment. How good is he really? And does anyone know? That's why Ron wouldn't touch him - Ron likes certainties. Red Bull has just stated pretty clearly that they have their drivers for next year. I believe them, although with Newy on-board it would be a nice match. Ferrari is the same situation (why would they extend Massa's contract at a time when it was quite clear Fernando would no doubt be available?). Williams doesn't have the money and I'm not convinced Frank would put up with his antics/attitudes. Toyota, not chance. It would be all about the money and I don't see FA in that mode. The rest? There's nothing they have to offer that could possibly interest a driver who needs to clean up his reputation. The only downside I see with Renault is they may not have the car next year. But I think Flavio can convince Fernando that they'll go all out to give him what he wants and needs. All that said, I'm they guy who thought Juan Pablo was going to be the next big thing in F1. I agree that the Renault option is the one that makes most sense, Don. Suddenly it's looking less likely, however, and I suspect that money is the problem. Renault just won't pay what Alonso wants. Maybe Flavio will make up the difference out of his own pocket but I doubt it - he's just bought a football team and can't have a lot of spare cash floating around. It's weird, but Red Bull look the best bet at the moment. Actually, I think Red Bull would be a great option. But I have just read that they stated pretty clearly that they have their drivers for '08. But statements of fact from F1 teams do seem to have the weight of a flock of blue butterflies...don't they? By the way, I went to Alinora's blog on your recco. Great info, but not being terribly computer literate I think it's going to take awhile, if ever, for me to get comfortable with it. I'm sorry I'm late to this one Clive, running a plantation things get busy this time of year, the last mowing prior to winter, etc.....but I didn't miss your remark about me: "unless my commenter, Number 38, is right and Pedro turns out to be as fast as Hamilton!" Pedro as fast as Hammy ! Did I say that? I think we'd better tone that remark down a bit.....I think DLR has EARNED the seat, he DESERVES the seat more so that Paffet and I'm sure DLR won't argue about who's #1, he'll just go to work and prove it! Of course he'd be #23 next year and that's a number promotion for my other protege, the current #23! Paffet will get his turn but he needs another year testing, he needs more mileage in his logbook. Alonso to Red Bull, Webber to Renault, make my head spin.....Coulthard retiring....... NO NO NO anything but that! SPECULATION, the game that never ends! Yeah, I read that too about Red Bull already having their line up for 2008 - but the availability of top drivers tends to make team managers very forgetful of contracts. If Red Bull really want Alonso, they'd find a way, I'm sure. That's the thing about Alianora's blog, Don, it's a little bit quirky and takes some getting used to. But top quality information if ever you need it. I think you got carried away once and said something about DLR being able to do just as well in the McLaren as Hamilton has done, Number 38. No question, DLR has earned the seat but that rarely counts for much in F1, does it? Still, he's in with a very good chance this time, I think. McLaren may give Pedro the drive to keep their Spanish sponsors happy. Given that the only reason they are with McLaren is Alonso and he has gone any promotional efforts that involved him are going to be hard to achieve with an Englishman, a Finn or a German. You have all got it wrong. Therefore it is clear that those that bought Bernies cars are to set up a new team with 'You know who' as driver, to compete in the 2008 series. Gosh you chaps are SO uninformed! donwatters, please could you tell me what it is about my blog that is causing you problems? If I can get feedback as to why it's causing difficulties (and as Clive has pointed out, it's not the easiest to use), then I can try to make changes within the template's limitations. As to Lewis Hamilton's new team-mate, I think it should be someone with proper experience, but I suspect that somebody relatively new will be on the team - otherwise, I can't see Lewis being allowed to say that the three relatively inexperienced drivers of Rosberg, Sutil or Kovalainen are going to be his team-mate. 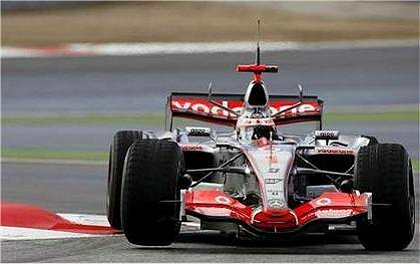 If Pedro de la Rosa or any other McLaren test driver was going to be given the seat, McLaren would have announced it already to stop the rumours and move forward. there are articles out there offering who Hamilton would want but I ask this, "Who would want Hamilton?" Many would like to drive a McLaren but few would LIKE to partner Hamilton. Whoever gets the seat will KNOW they are in the second car!!! As regards McLaren announcing who gets the seat if it were going to be one of the it test drivers, that's true, Alianora - assuming that the team know the choice at this time. I suspect that even Ron doesn't know, having only just sorted out Alonso and now he will take time to think about it. And that's a good point, Number 38 - everyone wants a McLaren but no-one wants to partner Lewis! "when was the last time a team manager used logic ..........."
Sadly F1 is a BUSINESS before a sport and POLITICS is the engine that drives the BUSINESS. Have you ever seen logic and politics work together?